Aikatsu Friends! – 014 | Mezashite! What do you mean summer uniforms only last for two months? They would’ve needed them if they were in LA last week for Anime Expo with 110+ degree weather. What a wonderful development episode for Honey Cat, really going far above and beyond what an uninitiated would expect from a children’s cartoon. I don’t want to say too much and just leave you to enjoy it on your own, but there is one note I’ll be putting below the break, so check that out after you watch. Also, important note: No new episode this week because Pokemon decided they wanted to be so important and steal the timeslot. Episode 15 will be one week from today/tomorrow. My own trip to AX was pretty amazing too. I don’t have a huge, emotional essay to write like last time, but again to everyone I met, thanks for being awesome. My own highlights were meeting my personal idol Okada Mari and getting her autograph (three times), all the other directors, producers, and artists I got signatures from, the magical experience of coincidentally meeting two i☆Ris members in person at the Pretty series cosplay meetup before their concert (which was just as incredible), seeing the Kase-san overseas premiere, and all the other great stuff I experienced. I’ll be looking forward to seeing some more of you the next time I venture out! I wanted to make a note about the title of their song, 個X個（きみかけるわたし）. The title as written in kanji means personality times/multiplied by personality, but the reading of it is “you times me”. While representing that Maika and Ema are strong individuals with their own characteristics, by multiplying them together, you get a far greater product. Also, it sounds really cute. so, episode 15 will air on July 19th? Yes, that’s what the aikatsu.net site says. I’m jealous you got to meet Sophie/Emo. Thanks for the subs as always. First thanks for the episode. 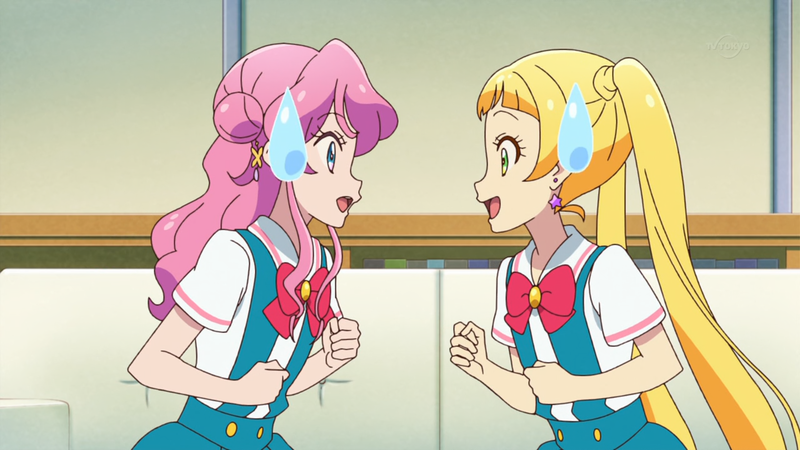 I loved this episode, I was getting ready to go on a rant when Mio said that one of them would have to give on their personality to make the unit, but then Maika and Ema showed her that they don´t need to match each other to make the unit work, that was just classic Aikatsu right there. Also sweetie and spicy kitty coord, sweet spice am I reading to much into it. Those summer uniforms are so much better than the regular ones. First time too, because I’ve always liked the standard uniforms better in any Aikatsu series. Did episode 15 air in its expected time slot (July 19)? My usual source for the raw episodes hasn’t posted yet today, 10 hours after the normal time when they post. I’ve never seen them go more than an hour after airing. Where do folks usually get the raw episodes, for those who watch them before the subs come out here? It’s not this site (Mezashite) but one of the raws sites that doesn’t seem to have updated anything since last night. Their web site is up but their posting of torrents may not be working. Seems that we’re getting one step closer to the World Aikatsu Cup.